As Tales wishes all a Happy Holy Week with Passover and Easter upcoming at the end of the week, we would like to do this repeat parody of Alice in Wonderland. It was a crisp cool December morning in this small Missouri town in 2004 when young Alice would follow that rabbit to the rabbit hole. Curious Alice looked down the rabbit hole when all of a sudden a strange wind swirled around making the hole bigger and bigger when Alice suddenly lost her balance and went head first down that hole until she landed with a big thump in a strange looking place. Alice did not recognize any of this in Missouri and thought this must be a wondrous land. "Where am I? ", wondered Alice out loud, when all of a sudden this friendly rat startled her as he blurted out, "you are in the Divided States of Obamaland in the year 2014." Alice quizzically asked, "don't you mean the United States of America in the year 2004?" "Oh, no my dear Alice", said the rat. "Since January of 2009 the people of the old United States of America, decided to elect a King who had promised to fundamentally change that old evil country. This king kept his word and by using divisive tactics our great leader, in less than 6 years, transformed the old United States into the new Divided States." Our new motto: "Divided Obama stands." 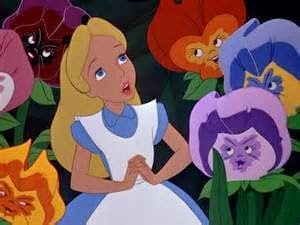 "Miss Alice you are now in a land where up is down, good is bad, East is West and rational is irrational. It is wonderful." "Now let me take you to our tea party, where not just tea and cookies but all kinds of goodies are delivered to the people from our generous King Obama." When they walked over Alice immediately saw two groups of people. On one side, people were laughing and having fun with their tea and phones and all kinds of goodies to help them live. On the other side Alice saw people working hard, sweating and not joining in on the tea party with the others. "Why aren't those people on the other side joining in the tea party? ", Alice asked the rat. "Oh, my dear Alice, our king had to make sure some of the people had to work in order to pay for the tea party for the masses. The people working have been privileged for many years. They can buy there own goodies and don't deserve the freebies the poor exploited masses do." Alice wondered, "That doesn't seem fair that these people have to work hard all day and don't get to join in the tea party with the rest of us." "Well, Alice, that is why our wonderful King Obama, devised this plan where they wouldn't have to work all day. He established Obamacare that incentivised companies to cut those hard working people's jobs to part time [under 30 hours a week] so those companies could avoid paying the onerous Obamacare taxes. So, see Alice our king, unlike some people try to say, is concerned about those people working hard to pay for those who shouldn't have to work at all. He made sure their hours were cut. Now our new Divided States of Obamaland has become a part time working country." "What about that Obamacare you talked about Mr. Rat. Do the people who work hard to pay for others to get free Obamacare also get Obamacare? ", asked Alice. "Why of course Alice." laughed the rat. "They must be in it unless they want to to pay a tax and be without health care insurance"
"Hmm", mused Miss Alice, this wondrous new land was beginning to seem less wondrous the more she learns about it. The rat then led Alice further into Obamaland to show her the 'Building Of Amnesty'"
"Oh", asked Alice, "is that where immigrants waiting in line for years go to take the citizenship test to become citizens?" "No", said the rat, "the Building Of Amnesty is for those people who broke into our country illegally, get to go in front of the line by shouting Si Se Puede." "Our benevolent king made that ruling with his pen and his phone, saying that it is only fair that those strangers in the shadows should get preference over the legal immigrants who were foolish enough to have followed the silly rules of the tired old America." Alice told the rat that didn't sound fair to her, whereby the rat scolded Alice, "Now, now Miss Alice, that is not very Christian of you. Our king, an expert of the scriptures, could teach you a thing or two about that." Then the rat led Alice further down the path where they saw another large building called the Obama Main Stream Media Times. On the side of the building was written its motto: "All the news that's fit to make our king look good." As they walked further down the wondrous Obamaland Alice and the rat encountered thousands of protestors very upset shouting, "Hands up, don't shoot." "Why are these people so upset, Mr. Rat? ", asked Alice. The rat answered, "They are upset because the poor Ferguson rioters, who looted and committed arson, didn't win the Time Magazine's person of the year award. Instead the award went to some rich undeserving doctors, who all they did was help some poor people who had the deadly Ebola virus." "Well let me ask you this, Mr. Rat, why were there rioters in Ferguson looting and committing arson in the first place?" "That's easy, Miss Alice", said the rat, "They rioted because this evil police officer who risked his life keeping them safe for over 6 years, shot and killed this man who had just robbed a liquor store, just because the man attacked the officer, reaching for his gun and then charged the officer, threatening his life." "That officer, could have easily let the man continue his charge and kill him, and then our Obamaland would have not have been thrown into turmoil with riots in Ferguson and protests all over the country, like it has. All just because of a selfish police officer wanting to protect his life." "Mr. Rat", asked Alice, "let me also ask you this. Why were those protestors shouting "hands up, don't shoot?" "Because Miss Alice", answered the rat, "this nice young man, Dorian, who was a friend of the hero Michael who was shot and killed by that mean police officer, told the world that the police officer shot his friend in the back when his friend was surrendering with his hands up in the air, saying don't shoot." "But Mr. Rat", said Alice, "you said it didn't happen that way and the officer was just defending himself against a man who was attacking him." "That is true, Alice", said the rat, "but in this new Obamaland a lie will always trump the truth if it is deemed to be fair according to our king and his attorney general and the news media." When Alice asked if Dorian got in trouble for not telling the truth, the rat told her, "Oh no, my dear Alice, he was given a government job." "Oh, Mr. Rat, I think I am beginning to not like this wondrous Obamaland anymore. Can you please take me out of here so I can go back home to the old United States of America? ", begged Alice. "Well that is not possible, my dear Alice. ", said the rat. "You must remain in this new Divided States of Obamaland until January 20, 2017. That is when our great King is forced by the evil constitution of the old United States, to give up his office to a new leader." "Even then", continued the rat, "you are not guaranteed to go back to the old ways as this lady Hillary could be elected our new King." "King? ", wondered Alice. "If Hillary won, wouldn't she be the queen?" "Oh, no" said the rat, "if Hillary won, then Bill would be the queen." Alice wondered silently to herself, "why oh why did I follow the rabbit down that awful hole?" The End ... of America? Fantasy or true horror story? ?